Matthew Morrison created one of the most legendary characters in musical history with his portrayal of Fabrizio Nacarelli in the production of The Light in the Piazza, a role that earned him a Tony Award nomination as well as industry praises and admiration. He boasts a prolific mixed career with a background in acting, songwriting, and dancing. Morrison formally launched his career way back in 1999 following his impressive high school and college stints that saw him participate in a slew of musicals and theatrical productions. The actor has also been doing great on the screen as well, he is best known for portraying the fictional character Will Schuester in the critically acclaimed TV series, Glee, which aired from 2009 to 2015. Only a few people know that the actor is also known as Matt Morrison. This is because he is popularly known by his birth name – Matthew James Morrison. Matt is a native of Fort Ord, a city in California, in the United States. He was born on the 30th day of October 1978 to Thomas Morrison (father) and Mary Louise (Fraser). He is half English and half Scottish, in addition, he holds an American nationality by reason of his birth in the U.S. The multi-talented performer had his high school education at the Los Alamitos High School campus, where he was an active member of the Orange County High School of the Arts and the Collaborative Arts Project 21 (CAP21). During his days at the Los Alamitos High School, Mat and renowned actress Jodie Sweetin did a musical together. Upon leaving the institution, Morrison joined the New York City-based University, Tisch School of the Arts, where he was coached for two years before he eventually dropped out to participate in the Broadway adaptation of Footloose. By the time he became a freshman in college, he had already performed in numerous Broadway productions and was popular within the acting circle for his dancing and singing talents. As earlier stated, Matthew debuted in the musical theatre in Footloose. His next major performance was in the revival of The Rocky Horror Show, which was displayed in the year 2002. The actor, however, had his career breakthrough after he was cast as Link Larkin in the Broadway production of Hairspray, which was written by John Water and originally released on 16th February 1988. It was his superlative performance at the play that paved way for big roles in shows and television. Matthew Morrison also plies his trade outside the American showbiz industry. Sometime in April 2013, he stormed the United Kingdom, where he guest-performed at the Royal Opera House in London at the 2013 Laurence Olivier Awards. Matt also played a role in the musical, Finding Neverland, wherein he portrayed the character J.M. Barrie in the production which opened in April 2015. Some of his acting credits include Primary Colors, Once Upon a Mattress, Ghost Whisperer, Simply Funk, Numb3rs, Music and Lyrics, CSI: Miami, Marci X, and Hack. As a musician, he has released two studio albums so far. His debut album titled Matthew Morrison made its way to the music world on 10th May 2011, after it was announced on January 14, 2010, that he had signed a solo record deal with Mercury Records. Matthew’s second studio album titled Where It All Began was released by 222 Records on July 7, 2016. The actor has also worked with veteran English multi-hyphenate Elton John in Summer Rain, which is his first single premiered on Ryan Seacrest‘s website on the 28th day of February 2011. 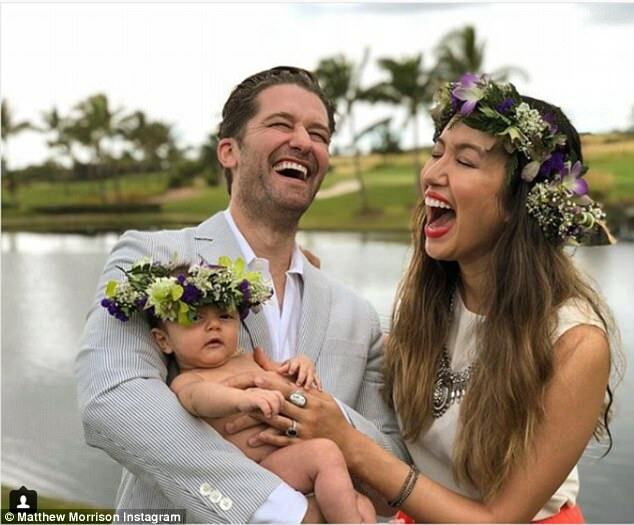 Matthew Morrison is known to have won numerous accolades and nominations for his involvement in the production of works as Hairspray, Glee, Finding Neverland, 10 Million Miles, and The Light in the Piazza. Renee Puente is a Hawaii-born actress best known for starring in the action-adventure thriller, Divergent as well as Tell Me I Love You and Dave & Ethan: Lovemakers. She got married to Matt at a private home on the island of Maui on 18th October 2014 after dating for three years. The couple’s engagement was formally announced by Elton John on June 27, 2013. Renee (born ‎October 5, 1984‎) and Matthew Morrison share a son together. He was born in 2017. Before the actor finally got married to Puente, he briefly dated actress Lea Michele and was previously engaged to 1.67 meters Draffenville, Kentucky-born actress Chrishell Stause. Matt is multi-talented and has been able to forge a path for himself in the industry. He is worth $10 million. He basically makes his money from his Broadway, Off-Broadway roles in theatre, film, and television, as well as his singing career which has been on the upward side for a long time. The California star is quite tall – his height is measured to be 6 feet or 1.83 in the metric unit while his body weighs 76 kilograms or 167.5 pounds. Details of his other body sizes are not available online right now.